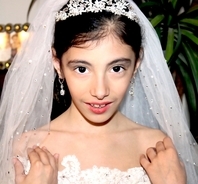 Description: Beautiful rhinestone communion tiara or flower girl tiara. the perfect fit for your little one, romantic sweet and sparkling she will love it. approx. 3/4" at highest point with two hoops on each end for bobbie pins.